After a week in Delhi learning the basics of motorcycle mechanics, adventurer Gerry Moffatt is acclimatizing at 12,000 feet in Leh, the capital of the Himalayan kingdom of Ladakh in northern India. On September 12, he officially begins a 3,000-mile journey across the Himalayas by motorcycle, kayak, and on foot. The expedition is the crux of Thunder Dragon Media’s latest film, “The Roof of the World: A Himalayan Odyssey,” in which Moffatt, just shy of his 50th birthday, reflects on 32 years of guiding expeditions in the mountains and rivers of India, Nepal, and Bhutan. The film will share the region’s fascinating history and geography though colorful vignettes following Moffatt’s adventures, and ask the hard questions about the future of the region in the face of modern development and environmental changes. I’m sitting in the living room at the Zajeed Palace Guesthouse, a traditional Ladakhi home run by the most awesome family in the entire world — who are all sitting around listening to this conversation and grinning. We’re in the city of Leh, which is in India on the northern side of Himalayas close to the borders of Pakistan and China. Leh was part of the Old Silk Road and it’s on the edge of the Tibetan Plateau at about 12,000 feet. So Leh is a logical starting point for a tip-to-tip expedition across the Himalayas? Exactly. Leh is at the northwestern edge of the Himalayas, and I chose this point to start because it’s a division point between the Himalayas and the Karakorum, the actual beginning of the Himalayas. Plus, in this neck of the woods you don’t have the yoga ashram culture. We’ll see that when we get to Rishikesh in a few days, where we’ll explore the explosion of religious tourism which has grown into this huge economic complex of ashram retreat-type vacations. It’s interesting to watch the development, and the interest of the people from the West who are descending on Rishikesh and bringing their own gurus with them to a place that’s becoming the international spiritual center of the world. But for now, I’m in Leh, in India’s wilderness, where it’s a much harsher and adventurous environment that’s great for trekking. We’ve been here acclimatizing and leaving the West behind. As part of your acclimatization, you did an ambitious kayaking trip on a very remote river — solo. What spurred that? Some of it revolves around it being my 50th birthday, and having spent the last 30 years mapping the river systems of the Karakorum area but never having done Tsarap Chu. It’s one of the main tributaries that form the Zanskar River through what’s known as the Grand Canyon of India. For 120 miles, the Tsrap Chu cuts through one of the most remote regions of the Tibetan Plateau. I knew I had the skillset to do it, and really wanted to do something on my own in the wilderness away from anybody else. It’s a great gift to be able to access this type of environment: really remote monasteries that date back to the time of the Buddha, no roads, clear turquoise water, and mind-blowing whitewater. I mean, I love paddling with my friends, but it’s a very different experience when you’re out there by yourself and unencumbered by group dynamics. It was a really special treat. I definitely thought long and hard about going in and doing it solo. It’s a heightened level of intensity when you’re by yourself. 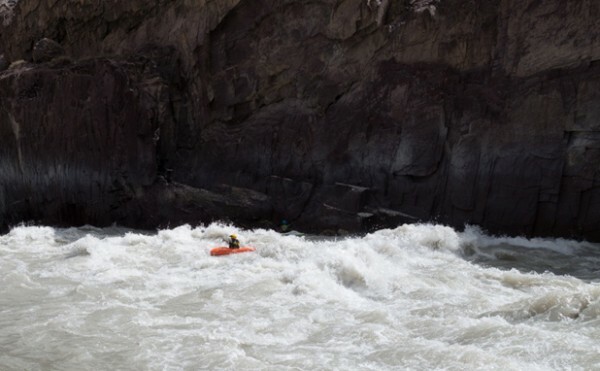 You can’t afford to make any mistakes or have any lapse of concentration in the whitewater. But that’s balanced by this amazing beauty that keeps you energized and motivated. I knew the crux came at a point on the river known as Reru – which had seen a landslide not too long ago that created this un-runnable section. The portage I ended up doing took me several hundred feet up a very steep cliff face with no way back once I started. I had to be completely committed to getting up and around this thing with no spectators and no witnesses. It was really, really hard – one slip and you’re gone, it’s game over. How long did the kayaking take? When do you start your 3,000-mile Himalayan Odyssey? We need to get out of here before the snows arrive because we have to cross the highest pass in the world, Khardung La. In the winter, the pass gets completely snowed in and isolates Leh for six months of the year. Tomorrow I’m going to ride up to the pass to take a couple photographs, and will consider that the beginning of my journey. Tell us about the motorcycle you’re taking on this journey. It’s probably one of the most beautiful machines in the world. It’s a 1982 iron clad Royal Enfield 500cc motorbike. The design really hasn’t changed since 1945. It’s a bit of a tank. It’s a single cylinder machine that makes the most beautiful thumping noise. They were originally used by the British as border control machines. If you’ve seen the movie The Great Escape, it’s like the bike that Steve McQueen is using. It’s this beautiful old machine that really speaks to India. It’s kind of like a status symbol of India. And the really nice thing is just about every mechanic across India knows how to repair them. When I did my mechanics course in Delhi I realized I knew just enough to be dangerous. I sat down with these Indian mechanics and we pulled it apart and rebuilt it and then they sent me off with a bunch of spares. With the storms, I was worried about it. But after I finished kayaking and arrived at my hotel for the night, I could see the shadow of my motorcycle. It turned up almost miraculously, having made the journey from Delhi to Leh. That’s the thing about India – even among all the chaos and carnage, things have a way of working out. What was the catalyst for the trip? I’ve spent my career working as a guide in India, Nepal, Pakistan, and Bhutan, and I got to the place in my career where I was working with very high-end clients. As much as I enjoyed that, I knew that it really wasn’t my path or how I wanted to enter into the third act of my life. I have the most beautiful partner in the world and she is ten times smarter than I’ll ever be. We got to a point where we really wanted to participate in the well being of the areas that had given us so much, and give voice to the people of the region who are working on sustainable development and rising to that challenge. Turning 50 was a big milestone, and enabled me to make a very conscious decision. I turned down all the guiding opportunities that were coming my way. I shut that side down to really devote myself to the idea of marrying adventures that were attainable and interesting and telling stories of the region that had a social message behind them. That’s when we came up with Thunder Dragon Media. And with the help of great friends, that’s how I came to be here in India on a Royal Enfield motorcycle about to take off for 3,000 miles and give voice to some of those rich stories.